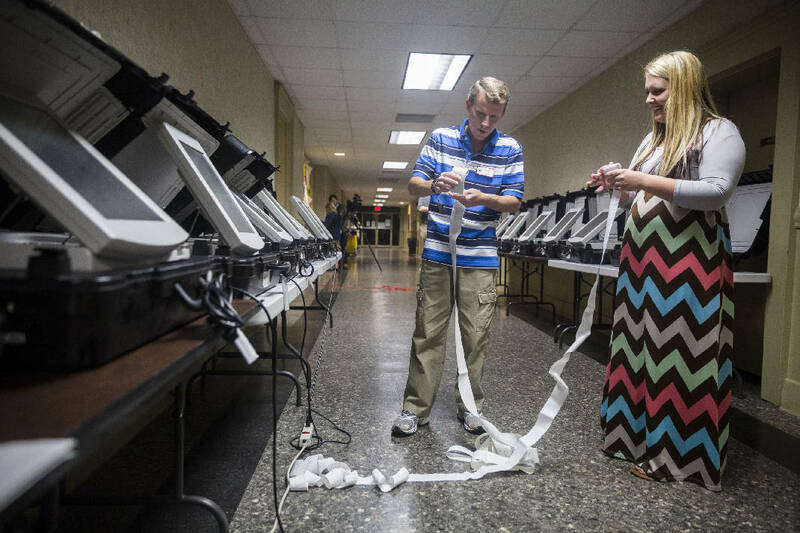 Chuck Fletcher, left, and Brittany Richardson roll up paper records of electronic voting at the Walker County Courthouse on Tuesday, Nov. 8, 2016, in Lafayette, Ga.
Georgia voters decided not to let the state intervene in chronically failing school, voting Tuesday to keep these schools under the control of local school districts. The vote was emotionally charged across the state leading up to Election Day, pitting many educators and parents against Gov. Nathan Deal, who proposed creation of a separate school district for the state's lowest-achieving school. As of 11:45 p.m. the vote tally stood at 2,200,303 against and 1,455,575 for. Votes stacking up against the amendment to the state's constitution means the state cannot take control of low-performing schools and create an Opportunity School District, modeled in part after Tennessee's Achievement School District. If the state-run district had been approved, the governor would appoint a superintendent to run it, and they would have the power to place failing schools in the state-run district and convert them into charter schools, overhaul management or close them. Nearly 130 out of more than 2,000 schools in Georgia are considered failing and eligible to join the Opportunity School District. None of these schools are in Northwest Georgia; most are in the Atlanta area. But opponents of Georgia's Opportunity School District point to static test scores in Tennessee's Achievement School District, as well as the district's use of charter schools and how school control is stripped from communities.